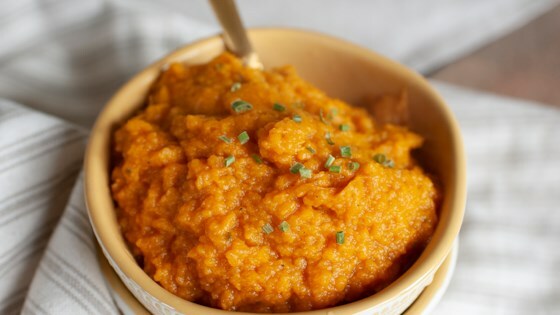 "Delicious, moist and full of flavor - save the oven and use your Instant Pot® for mashed sweet potatoes!" Combine sweet potatoes, coconut milk, vegetable broth, garlic, salt, and pepper in a multi-functional pressure cooker (such as Instant Pot(R)). Close and lock the lid. Select high pressure according to manufacturer's instructions; set timer for 8 minutes. Allow 10 to 15 minutes for pressure to build. Release pressure carefully using the quick-release method according to manufacturer's instructions, about 5 minutes. Unlock and remove the lid. Carefully remove pot insert and place on a trivet. Mash sweet potatoes with butter in the pot insert using a potato masher and season with salt and pepper to taste. You can use beef broth instead of vegetable broth and ghee instead of salted butter. No, made as directed by the recipe.